Kipchoge Keino needs no introduction. In his heyday he was the master of athletics tracks around the world, bagging medal after medal, gaining huge international recognition. Now 73 years old, the retired policeman and paramilitary officer still maintains an active lifestyle. 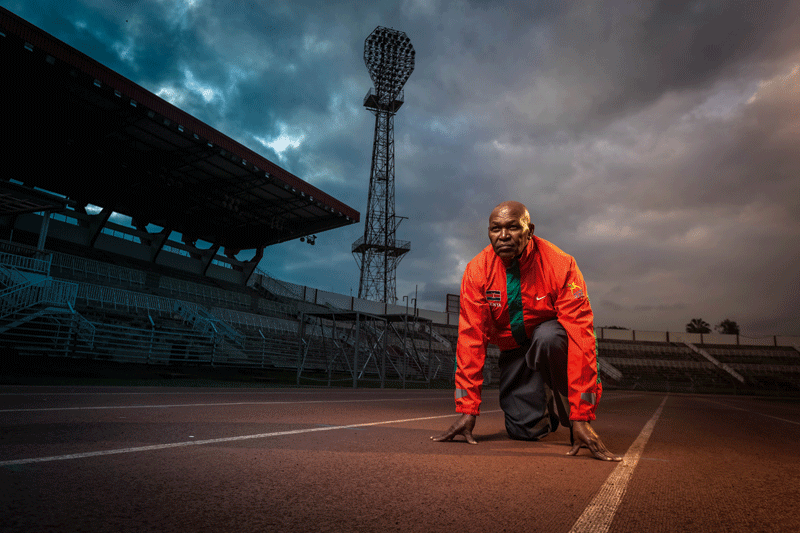 He is a farmer, is the current President of the National Olympic Committee of Kenya, runs his foundation (the Kipchoge Keino Foundation), and finds time to get involved in many community activities. Kip, as he is fondly known, may be a septuagenarian but still has an amazing acuity of mind – dates and details of races that he participated in decades ago roll smoothly off his tongue. Kenya Yetu met the sporting legend in Nairobi, where he discussed his career, his relationship with Kenya’s founding father Mzee Jomo Kenyatta, his involvement in sports administration, his motivation, and his passion for youth development, his involvement in it and what more needs to be done. Kenya Yetu: What a life! You have really done well. Kip Keino: Yes, thanks. I have done well for myself and for the youth of this country. When did you discover that you were really good at running? That was back in primary school. It was there that I realised that I was a good athlete since I won many races. I then began representing my school up to district level. However it was after school that I was able to build a career out of athletics. Were you involved in other sports? Yes. In my younger days I also played rugby, tennis and volleyball, and enjoyed swimming. However athletics was my main sport. I was born in Nandi Hills, in Kenya’s Rift Valley. At the age of eight I went to Kapchemoywo Primary School in Nandi until 1954 when I went to Kaptumwo Intermediate School. After four years I left to join the police force. How was your relationship with your parents as you grew up? I lost my mother when I was only three years old. My father was the one who took care of me. He was responsible for all my needs and was proud of me when I began running. He gave me all the assistance that I needed, which was sometimes financial. So, why did you decide to go to school? It was actually my father’s decision. He said that I should go to school. I had relatives in the military, including two uncles, and was advised to go to school so that I could also join some day. How did you become a policeman then? Initially, I had wanted to join the military. I even went for recruitment and was secured a place. However it took me a while before I was called to join. It was around this time, while I was waiting, that the police were recruiting. I got an opportunity and was called up. I stayed there for 16 years before moving to the General Service Unity (Kenya’s paramilitary force), where I was employed for four years. What were your experiences in the police force? It was an interesting time for me, and very busy because I was also an athlete at that time, which meant I had to train consistently. As a police officer I was at Kapenguria and then Maralal with Kenya’s founding father, the late Mzee Jomo Kenyatta. I stayed there with him until he was released and he went to Gatundu. However, I left after six months to return to Kiganjo Police Training College. Soon after this, I was promoted. Throughout my career, whenever I broke an athletics record, I was given a promotion. By the time I left I held the rank of Chief Inspector. What was it like interacting with Mzee Jomo Kenyatta in those days? He was a good leader who could talk very well. I remember bringing him his coat and shirt from Kapenguria to his Gatundu home. Then there was a time he called me and asked when it was best to go and see Mount Kenya at its most visible. I told him that between 5.30am and 5.45am the mountain was very clear. He asked me to wake him up so that we could go and see it, which I did. He was so happy and touched the grass. He would visit again whenever he wanted. Kenyatta liked me very much. He even conferred on me the Distinguished Service Medal. Which was your first race outside Kenya? I went to the United Arab Emirates to run in 1959. I also qualified for the Olympics in 1960 but they said I was still too young and would not accept me. When did you finally hit the international race circuit and start winning the gold? My debut in international compet-ition was in 1962 when I qualified for the Commonwealth Games in Perth, in which I finished fourth. By this time I was already taking part in the East African Athletics Championships. In 1964 I qualified for the Olympics in Tokyo and finished fourth in the 1500m and sixth in the 5000m. I won my first gold medals in 1965 at the All Africa Games in Congo Brazzaville, where I was captain of the Kenyan team. I went on to win several other gold, silver and bronze medals after this. I broke my first world record in 1965 in a 2000m race held in Sweden, and by the end of my career I had broken several records in different races. How many medals did you win; and where are they? I won two gold medals and two silver medals in the Olympics. At the Commonwealth Games, I won three gold medals and a bronze. And in the All Africa Games, I won two gold medals and one bronze. I was also given medals whenever I broke a world record. Tell us about the infamous gold medal that you won convincingly in the 1968 Olympics in Mexico while suffering from gallstones. Yes, I had been checked by doctors and found to be suffering from gallstones but I insisted that I had to take part in the race. I told them that I came to run and I had to because I was representing my country. Comparing then and now, what major change do you see in athletics? I was among the first people who started professional athletics – running for money. That is why you see our athletes earning a lot of money from athletics today. Was it a glamorous life going to different Olympics, especially as you were among the first African athletes to do this? It was more hard work than glamour. As an Olympic medallist, I was proud of what I had achieved for my country and myself. It is through such discipline that you are able to do well, and the youth can imitate this and do something for themselves. That is why I am involved in providing training and advice. How did you make the transition to coaching, and what motivated you to do so? I became a coach in 1976 after undertaking a coaching course at a military school in Scotland. During my time as an athlete we did not have any coaches – we learnt by talking to people and observing what other athletes did. Are we doing enough for sports development in Kenya? Yes, the government has a lot of interest in sport, and we often sit and talk. At the moment we are planning for different events such as the 2014 Youth Olympics and the All African Games. We need to develop our youngsters so that they qualify and perform well. We need to fight to have more money invested in sport. What do you think needs to be done for sports development in Kenya? We need to fix a lot of things for the youth of this country. We should invest in all sports. Sports today are businesses. We have seen how much footballers and other sportsmen earn. Every country needs sports infrastructure and the people to take care of it. If we do not invest we will be overtaken by events. We should work together to invest in sports and generate money for its development.We could set up a sports lottery, so that we do not have to keep going back to the government. It is being done in the UK, South Africa and other countries, and we could do the same in Kenya to generate money for sports development. There have been rumours and accusations of athletes taking performance-enhancing drugs, even in Kenya. What are your thoughts on this? During my time as an athlete, we did not have such cases. What is happening now is because of the agents. Ordinary athletes in the developing world do not do this. I do not blame the athletes – I blame those who are trying to take advantage of our youths. We are trying to spread the message against doping. We hold seminars for young aspiring athletes in the rural areas to educate them against drug abuse so that they are not misled. I am married and we have seven children. I also have six grand-children and, including those in the children’s home, there are 30. Has it been difficult balancing family life and your very busy career? Not at all – it has never been difficult. I managed to work out how to create the balance. The key for me has been investing in a good education for all my seven children. What is the secret to a successful marriage? I have been married since 1963. From my 50 years experience in marriage, the secrets are to love and to thank God for all that he has given to you. Also, it is important to always communicate. You look young and active for your age. What is the secret? It is all about discipline. I do not drink or smoke. I also take time to exercise, and stick to a balanced diet. I regularly jog or go to the gym. Are you considering retirement some day? Absolutely – I want to retire at some point. In the next six years, I want to retire. Apart from Martin, are any of your other children keen on athletics? Yes – they have each been athletes during their time in school. In fact, they even represented their university in the US. What drives you to improve and excel? When you love something, you put in effort to improve consistently. It is because I loved athletics that I worked hard at it. It is for this reason that I started a high-performance training centre in Eldoret, which has benefited many young people, including Ezekiel Kemboi and Asbel Kiprop, among others. I have also put up a primary school and a secondary school and am currently constructing a 25-metre swimming pool at each of them. Self-discipline, hard work and a willingness to learn: you have to sweat it out and learn by watching and imitating others. For instance, during my time as an athlete, I could only train for three months in a year because of my police duties, while in other parts of the world athletes trained for up to six months. But I had to use my own time and go for training. I had to cope in order to train like them. I am proud of having gone to the Olympics and all that I have been able to achieve for myself and for my country. What role has faith played in your life? You have to thank God always for what He has given you. What motivated you to set up the Kip Keino Foundation? I started the foundation ten years ago because I wanted to assist the community. Through it, I have set up two schools – a primary school and secondary school – to support orphans and aspiring athletes so that when they are through with their education, they are able to have a good life and give back to society. Why do you particularly focus on helping orphans? It is the responsibility of all of us to take care of orphans because they are also members of our society. Whatever happened to them is not their own doing, and is not their mistake. They therefore need guidance, shelter and to be taken care of as human beings. If you were to offer President Uhuru Kenyatta recommendations on youth and education, what would they be? The youth need to be empowered. The most important thing is to give them a good education. In addition to this, we need to invest in sport. We should work as a team and seek advice from each other so that in the end, we are able to be stronger. In 1996 you were inducted into the World Sports Humanitarian Hall of Fame. How do you feel about that and the other international plaudits for your work in social development? The Hall of Fame is recognition for what one does in society for humanity and helping the youth to improve. I am happy and proud of this recognition. World Class has nothing to do with what we don’t have. Kip believes that those who appreciate and fully utilise what they do have, regardless of how little, are those who are truly world-class. World Class has nothing to do with the size of your organisation or the amount of capabilities you possess, it’s about your attitude. Kip specifically believes that just taking the situation that you face and making the best with that is in itself world-class. World Class has nothing to do with what you acquire but has everything to do with what you contribute. Kip believes that those of us fortunate to be gifted in whatever way, have a responsibility to use those capabilities in a disciplined fashion and be stewards to the community. World Class has nothing to do with just using a variety of capabilities. Kip believes that it is through the discipline of identifying the individual and team talents that are truly extraordinary, and then to develop and use those talents to their fullest. World Class is not primarily accomplished based on our capabilities; World Class is 75% attitude. Ask Kip why he has always been willing to share his secrets with his competitors, and he responds with a simple explanation: by sharing, the world is better off. In his specific competition, he believes he will still likely win because his advice only effects their capability, not their underlying attitude where he always excels. World Class is not generally an individual accomplishment. Kip believes that group efforts in thought and actions always create superior results. World Class is not about breaking down every barrier. Kip believes that results are best achieved by not forcing things, but either going around issues or just returning at a later time when they are more easily achieved. He believes in the importance of leverage. Use your best capabilities where they are more likely to achieve results. World Class leadership is not about focusing on fixing people. Kip believes that great results come from focusing on what people are best at, inspiring them, encouraging them and supporting them and not trying to fix their weaknesses. World Class accomplishments always have a graveyard of disappointments. Kip believes that through challenges we become better, only if we learn from but leave behind frustrations and just move forward, everyday and with everything.